WASHINGTON (AP) — Two senior American diplomats, thinking their conversation about the Ukraine was secure and private, were caught disparaging the European Union in a phone call that was apparently bugged, and U.S. officials say they strongly suspect Russia of leaking the conversation. The suspicions were aired Thursday after audio of the call was posted to the Internet and amid continuing criticism of the United States in Europe and elsewhere over NSA spying on foreign leaders and U.S. They also came as the Russia-hosted Winter Olympics opened under tight security to prevent possible terrorist attacks and highlighted distrust between Washington and Moscow that has thrived despite the Obama administration’s attempt to “reset” relations with the Kremlin. White House spokesman Jay Carney pointed to the Russian official’s tweet and Russia’s clear interest in what has become a struggle between pro-Moscow and pro-Western camps in the former Soviet Republic. “I would say that since the video was first noted and tweeted out by the Russian government, I think it says something about Russia’s role,” Carney told reporters. He would not comment on the substance of the conversation, in which the Nuland and Pyatt voices also discuss their opinion of various Ukrainian opposition figures. An aide to Russian deputy prime minister, Dmitry Rogozin, was among the first to tweet about the YouTube video, which shows photos of Nuland and Pyatt and is subtitled in Russian. State Department spokeswoman Jen Psaki did not dispute the authenticity of the recording and said that Nuland had apologized to European Union officials for her remarks. The YouTube video was posted on Feb. 4 and is titled the “Marionettes of Maidan” in Russian. Maidan is the name of the main square in the Ukrainian capital of Kiev, which has become the center of opposition protests. 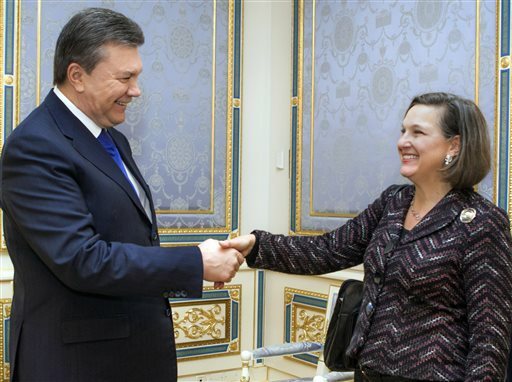 In the audio, Nuland and Pyatt discuss their views of various opposition figures and whether or not they should take positions in the government. The U.S. has repeatedly denied allegations, many of them from Russian officials, that it is taking sides in the Ukraine crisis and Psaki repeated that stance on Thursday. The practice of eavesdropping on the phone calls of other governments — even between allies — was the first diplomatic fallout from the publication of documents taken by former National Security Agency analyst Edward Snowden. The documents he took and that were published in such newspapers as The Washington Post, the New York Times and The Guardian showed that the United States listened in to the phone calls of allies such as German Chancellor Angela Merkel. Merkel was outraged, and part of the U.S. response was that such practice is common on both sides around the world.